The Rock Creek Trail is a soft-surface trail that follows Rock Creek from the Coalton Trailhead in Superior through the Carolyn Holmberg Preserve connecting with the Coal Creek Trail in Lafayette. Class 1 and 2 e-bikes are allowed during the e-bike pilot period. The Rock Creek Trail connects with these trails and properties. The Stearns Lake parking lot can accommodate 15 cars and 2 horse trailers. The lot at the Coalton Trailhead can accommodate 27 cars, 2 handicapped spaces and 3 horse trailers (1 with horse hitching rails). Group shelters available at Stearns Lake Trailhead and the Coalton Trailhead. Available at the Stearns Lake Trailhead and the Coalton Trailhead. There are two missing links along the route in Broomfield. In the rain shadow of the Rocky Mountains, the Great Plains are dry, windy and expansive. Receiving small amounts of precipitation, the land is dominated by grasses. The scarcity of water generally prevents larger shrubs and trees from growing. The exception is where rivers, streams or ponds exist. In these riparian habitats plant and animal life is more diverse due to the presence of water. Trees, sedges and cattails grow and a variety of mammals, birds, amphibians, reptiles and insects are drawn to the water where temperatures are often slightly cooler than the surrounding lands. In this riparian (streamside) ecosystem, expect to see many water-loving species of birds including ducks, redwing blackbirds, and even great horned owls. Mammals include foxes, coyotes, raccoons, skunks, and more. Cottonwoods, cattails, bulrush, and many different grasses are present here. Starting in 1990, the Coal Creek and Rock Creek Trails project is the product of an area-wide partnership. 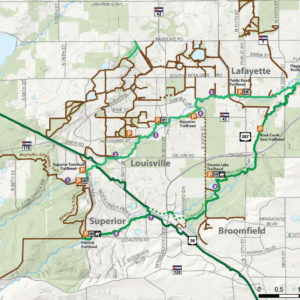 Boulder County, the Town of Superior, the cities of Louisville and Lafayette, and the Urban Drainage and Flood Control District, all worked and will continue to work together to ensure the trail’s completion.